It starts with a simple molecule -- two atoms of hydrogen linked to one atom of oxygen -- and grows exponentially. From a tear, a pint, and a snowflake to a rivulet, a pond and a lake. From a gallon, a tide pool, and an estuary to a glacier, a bay and a cloud. Water accounts for nearly 57 percent of an adult male's body weight. Nearly 70 percent of our planet's surface is covered in water. Unimaginable numbers of water molecules travel the earth via the ebbs and flows of tides, the acceleration of eddies and whirlpools and the dynamic surges of currents and floods, torrents and tsunamis. Some 1200 years after it disappeared beneath the surface of the Mediterranean Sea, the ancient Egyptian city of Heracleion was recently discovered by archaeologist Frank Goddo and a team from the European Institute of Underwater Archaeology. Hurricanes Katrina and Sandy showed the devastation that can be wrought by a storm surge. This footage of the tsunami that followed the March 2011 Tohoku earthquake off the northeastern coast of Japan offers stunning visuals of the power unleashed by vast volumes of water gathering momentum. Man has always had a love-hate relationship with salt water. While the fish it contains can provide seemingly endless amounts of nutrition -- and a sailing vessel caught in a doldrum can remain becalmed for days on end -- a tsunami like the one that struck the Indian Ocean in 2004 can kill nearly a quarter of a million people. How curious then, that San Francisco's recent DocFest should feature three documentaries (each with a different length and theme) which investigate man's relationship with the salt water in his life. J. Christian Jensen's charming short film, Between Land and Sea, chronicles the experience of a newly-married couple, Peter and Dina, who spent two years as the hosts of a combination lighthouse/bed-and-breakfast inn on a tiny island near the Richmond-San Rafael Bridge With stunning vistas of San Francisco, the work required to give visitors the fantasy vacation they desire can still be exhausting. After two years at the East Brother Lighthouse, the couple is ready to move on. Dina, at the very least, wants to be able to go shopping on a moment's notice. Numerous ship replicas can be found in museums around the world. From Thor Heyerdahl's reed boat Ra II (modeled on early vessels built in ancient Egypt) to replicas of the Nina, Pinta, and Santa Maria; from the Naniwa Maru, Hokulea and Mayflower II to the Jewel of Muscat, Princess Taiping, and San Juan Batista, faithful replicas crafted by enthusiasts of maritime history document how men learned to travel the ocean. Nearly 500 years before Christopher Columbus, Vasco da Gama and Ferdinand Magellan set out on their historic voyages of discovery, Viking longships had already visited the coast of North America. In 1974, Robert Asp (a guidance counselor at Moorhead Junior High School) was inspired to build a replica of the famous Gokstad ship, whose ruins were discovered in 1881 on a farm in Norway. Part of Asp's dream was not just to build the vessel he named Hjemkomst, but to sail it to Norway. Although Asp died of leukemia on December 27, 1980, members of his community fulfilled his dream by sailing from New York to Oslo in the summer of 1982. The full story is told in this half-hour documentary from Minnesota's Pioneer Public Television. In 1985, the Heritage Hjemkomst Interpretive Center opened in Moorhead, providing the Hjemkomst with a permanent home close to where it was conceived and built. Documentarian Eli Akira Kaufman's 12-minute short, entitled The Hjemkomst: Thirty Years Later catches up with members of the crew at a reunion to commemorate the 30th anniversary of their transatlantic voyage. It's a delightful piece of nostalgia which shows what a community can achieve when it sets its mind on accomplishing a goal to honor their heritage. Peter Young's magnificent documentary, The Last Ocean, focuses attention on the threat of commercial fishing to Antarctica's Ross Sea (one of the world's last large untouched and intact marine ecosystems). 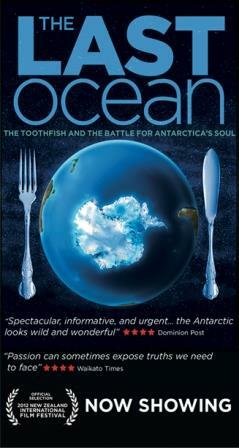 His film documents how the quest to tap the Ross Sea's stock of Antarctic toothfish (frequently sold as Chilean sea bass) is threatening to upset the region's natural food chain and how politicians in New Zealand and other seafaring nations are subject to fierce lobbying efforts by the commercial fishing industry aimed at preventing the signing of any treaty that would protect the waters of the Ross Sea. With Young's breathtaking cinematography (both above and below sea level), the filmmaker shows the natural beauty of this pristine environment and explains its critical importance as a global indicator of the health of the planet's oceans (which have already been severely overfished).